In a plant microbial fuel cell, solar energy is converted to electricity in a natural way. A technology developed by Plant-e. The technology is based on natural processes and is safe for both the plant and the environment. The system is applicable to all sorts of plants that live in moist soil. In a plant microbial fuel cell, solar energy is converted to electricity in a natural way. Plants use sunlight for photosynthesis, thus producing organic compounds. A part of these compounds is passively released through the roots into the soil. Naturally occurring bacteria break down the organic matter and release electrons and protons. 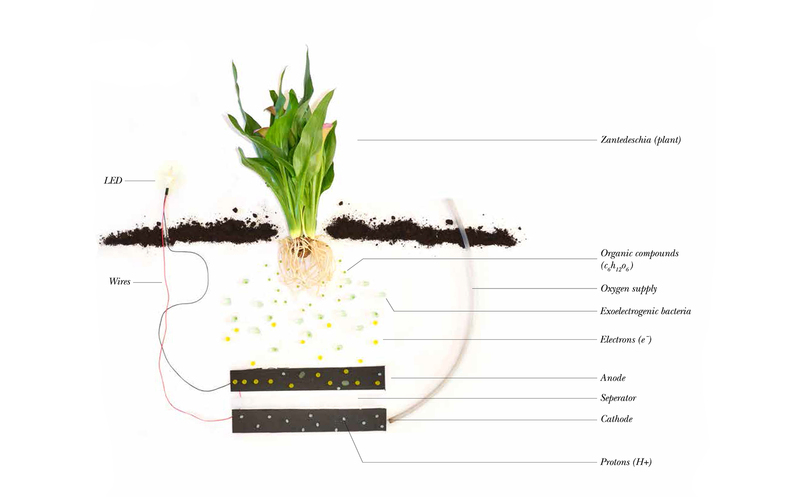 The plant microbial fuel cell includes an anode compartment that captures the electrons. The electrons are transferred through a wire to the cathode. The flow of electrons from anode to cathode can be used as electricity. Plant-e was founded on September 14, 2009 as a spin-off company from the sub-department of Environmental Technology from Wageningen University. The focus on developing the technology in which electricity is generated with living plants. Plant-e and Ermi van Oers are working together to implement Plant-e technology in interactive designs that engage people with nature around them. Using this technology extensively, an economical value to nature can be applied, giving an incentive for the construction and conservation of nature. Through these developments biodiversity will flourish, while lowering greenhouse gas emissions at the same time.